Sunday night, the Indians pushed their winning streak to 18 games. The next-longest active winning streak in baseball is five. Since this all began, the Indians, of course, have gone 18-0, and the next-best record in the American League has been 9-7. The goal is to win the World Series, and the Indians will be disappointed if they again come up short, but at a certain point, this will just become their legacy. Somebody wins the World Series every year. The Indians have one of the longest winning streaks that baseball’s ever seen. Doing something like this is more improbable, and it’s a reflection of how well the Indians have been built, from top to bottom. A truth about baseball is that a winning team is never as good as it looks when it’s winning, and a losing team is never as bad as it looks when it’s losing. The Indians feel like they’re bulletproof, mostly because they’ve been bulletproof for about three weeks. Their odds of winning everything haven’t meaningfully changed. It’s useful to keep the Dodgers in mind. The change in perception has been abrupt, even though it’s more or less the same active roster. Invulnerability isn’t forever, as demonstrated by the reality that everything dies. The Indians aren’t unbeatable. The chances are still that they won’t win it all. Upon eventual reflection, the team shouldn’t be judged only by how it performed when it didn’t lose a game. One should attempt to consider the whole of the picture. Let’s do that right now. 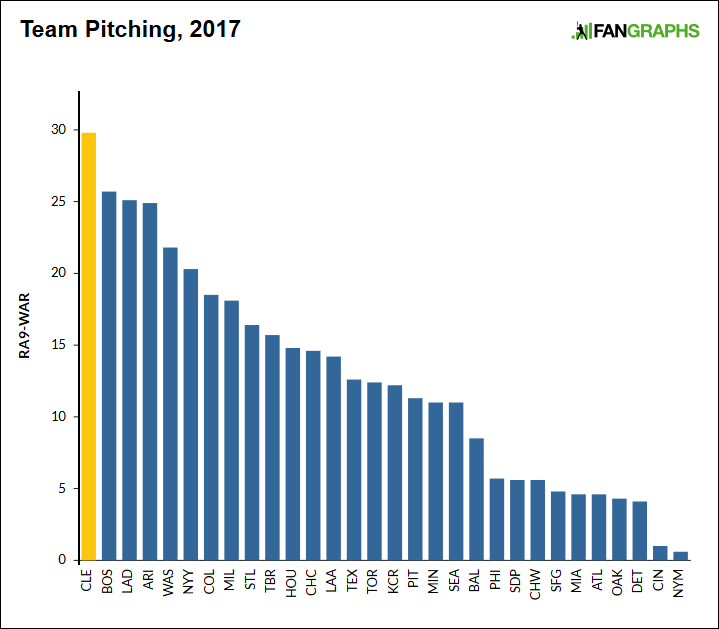 Let’s talk about the Indians’ pitching. On August 17, Travis wrote a post titled, “Cleveland’s Rotation Is Distancing Itself from the Pack.” It was! The rotation came together, and the rotation got hot. There might not be another rotation more fearsome when it’s hot. Now we can take an even grander view. We can think about the entire 2017 season, and we can think about the Indians’ entire pitching staff. This plot should be very easy to understand. Here’s how all the staffs rank this year, by WAR. That’s FanGraphs’ version of WAR. (On FanGraphs, it’s always FanGraphs’ version of WAR.) The Indians are way out in front, having achieved a measure of separation. The Indians are in first, and they’re in first by more than five wins. The gap between the Indians and the Red Sox is a hair wider than the gap between the Red Sox and the Nationals. It’s uncommon to have a team achieve such an outlier status. The picture doesn’t look very different if you choose to evaluate the teams by the runs they’ve actually allowed, instead. The regular WAR model is somewhat theoretical. The RA9-WAR model is less theoretical. Here’s how that looks. Indians in front, now by about four wins. The first-place status isn’t threatened, nor is the separation between first and second. Every team looks a little different by RA9-WAR, as opposed to regular WAR, but the impression of the Indians is unchanged. This year, the Indians have had baseball’s best pitching, and it’s been true by a significant margin. Once you understand who looks the best in a given season, it follows that you should be curious about historical context. Let me tell you — there have been very nearly 2,500 individual team-seasons going all the way back to 1900. I don’t know when you, personally, believe that baseball “began,” but when discussing statistics, I don’t know that 1899 is ever relevant. Even 1900 is probably going back too far, but, whatever. Since then, the Indians’ current staff ranks seventh in total WAR. They still have a few weeks left to play. To make everything even, I calculated every team’s WAR per 162 games. Behold the top 10. The Indians are on track to finish in first place. First place! Out of so many decades of baseball! But, again, maybe you don’t love the theoretical model. Maybe you don’t love how much our WAR equation strips out. So here’s the same table, only this time sorting instead by RA9-WAR per 162 games. Now the Indians drop all the way to…ninth. Third, since the end of World War II. Therefore, this doesn’t change things too much. Yet just as regular WAR might strip too much away, RA9-WAR might leave too much intact. A shortcut we use sometimes is to simply average the two measures to get a clearer impression of true talent. So here’s one last table, which looks like the last two tables. For this one, I’ve just found the midpoint for each team’s WAR and RA9-WAR per 162 games. And there it is. First place again. The Indians’ season isn’t complete. Their pitching numbers are going to change, possibly for the worse. And it should go without saying that our WAR metrics are far from perfect. They don’t, as one example, consider strength of opposing schedule. Maybe regular WAR is too far removed from reality. Maybe RA9-WAR isn’t removed enough. Maybe it’s too sloppy to just find the average of the two numbers as if it really means anything. You can argue as much as you’d like to, because there is always room for disagreement. But there’s a legitimate case to be made that the 2017 Cleveland Indians have the best pitching staff in baseball history. This is the evidence. By all-time WAR/162, they rank in first place. By all-time combined WAR/162, they rank in first place. They still have games to play, but they can perform worse while remaining where they are. When you think about the Indians’ staff, you think about Corey Kluber. He’s great! And when you think about the Indians’ staff, you think about Andrew Miller. He’s also great! Carlos Carrasco, further, has been great. The Indians have benefited from remaining generally healthy; Miller is down now, but he’ll be back soon, and the team’s needed to use only seven starters. An underrated aspect here has to do with depth, as the Indians have given just 24.2 innings to pitchers with a below-0 WAR. All those innings have been thrown by Shawn Armstrong, whose WAR is -0.1. 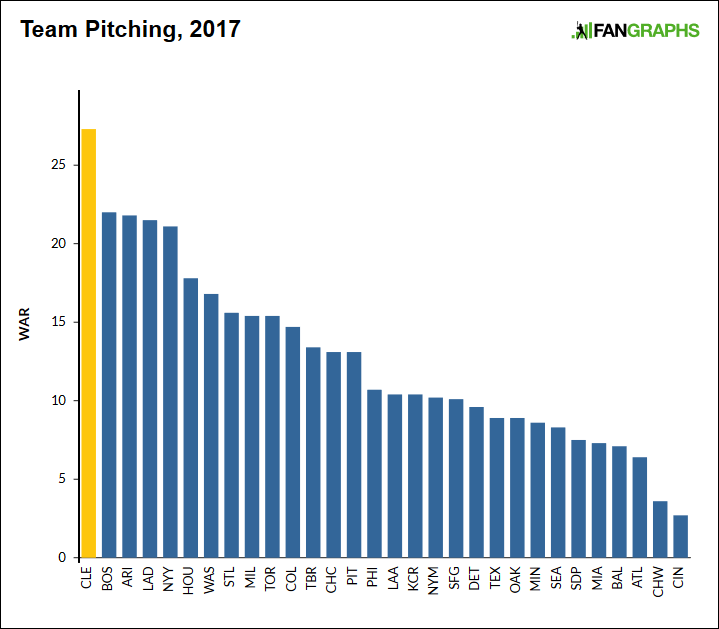 The Indians rank first in baseball in having the least negative pitching WAR, combined. They, again, stand at -0.1. The league average, and median, are -2.2. The Indians haven’t had to give time to bad pitchers, which is a subtle means of keeping the overall numbers terrific. The conclusion to something like this is always that, moving forward, it can mean only so much. Look back at that last table again. The 1997 Braves lost in the NLCS. The 2011 Phillies lost in the NLDS. I don’t need to tell you that this year’s Indians staff could lose, just as last year’s depleted playoff Indians staff mostly managed to win. There’s no such thing as solving October. The goal is always what lies at the end of October, but a team can only try to solve October by solving April through September. That’s where the Indians have accomplished their mission. Just in recent weeks, they’ve ripped off one of the longest winning streaks of all time. And if you go back to the beginning, the Indians have thrown what might stand as the best pitching staff in baseball history. It’s no wonder they’ve been a hard team to beat. We hoped you liked reading So the Indians Might Have the Best Pitching Staff Ever by Jeff Sullivan! Oversimplifying: How can the Indians staff be so much better than the Dodgers’, lets say, when LAD has given up the same amount of runs and earned runs, has a tick better OPS against, etc. Defense doesn’t explain it (and Cleveland fields well, if memory serves). From whence the WAR? Maybe this is a DH (AL vs NL) effect? There’s a massive gap in the offenses of NL vs AL, yes. Plus, Cleveland is a lot more hitter-friendly than Los Angeles, as ballparks go. Are you talking about the AL’s longstanding talent advantage, or just the DH scoring boost? The DH effect has been much diminished by the interleague schedule of 20 games for each team. From 1973-96, AL averaged +0.33 R/G over the NL. Since 2013, just +0.21. These reasons listed below are why “league and park adjusted” stats are so common place — straight runs, or even straight OPS, isn’t necessarily that meaningful for comparing apples to apples.